After landing in Santiago, Chile, a POWDER SOUTH representative will meet you at the airport and direct you to our van for ground transportation, or to your reserved helicopter connection, to transport you to your lodging in the mountains. 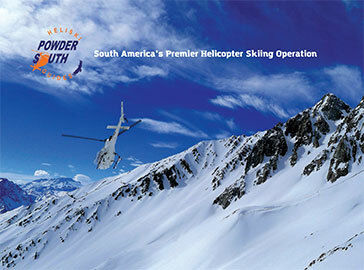 Once at the lodge, you will meet with your heli-ski guide for gear check, briefing, and group selection. Later an avalanche beacon search and safety clinic will be conducted, along with the required helicopter briefing. Welcome Dinner at the Lodge. Immediately after breakfast we walk to the heliport only yards from your room. Soon we will carve our first turns in the pristine Andes, an unforgettable alpine setting of Himalayan proportions. Each group will have a minimum of 1 heli-ski guide, a 4:1 & 5:1 ratio depending on the number of guests and helicopters we use. Today we take it slowly. It will be your first day exposed to the thin air at nearly 15,000 feet elevation in the magnificent surroundings of the dramatic and rugged Central Andes Mountains. Back to Base for the night to a well deserved gourmet dinner at the Lodge. After breakfast we start our 6th and final day of our heli-ski / heliboard journey into the Andes. After skiing, we pack and transfer you to your 5-star hotel in Santiago, for an enjoyable Friday evening in this cosmopolitan city.